WikiLeaks founder Julian Assange is expected to be expelled from the Ecuadorian Embassy in London within ‘hours to days’ on Friday morning, April 5, according to a WikiLeaks high-level source. 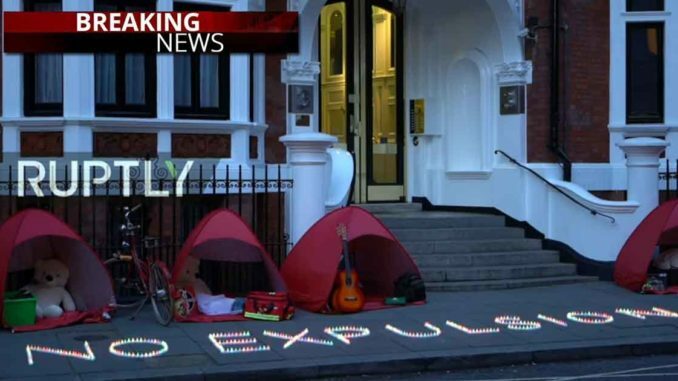 Ruptly is live from the Embassy of Ecuador in London, where Julian Assange is set to be expelled by the government of Lenin Moreno using as a pretext the INA Papers leak. The Ecuadorian government has according to WikiLeaks brokered a deal with the UK for Assange’s arrest.